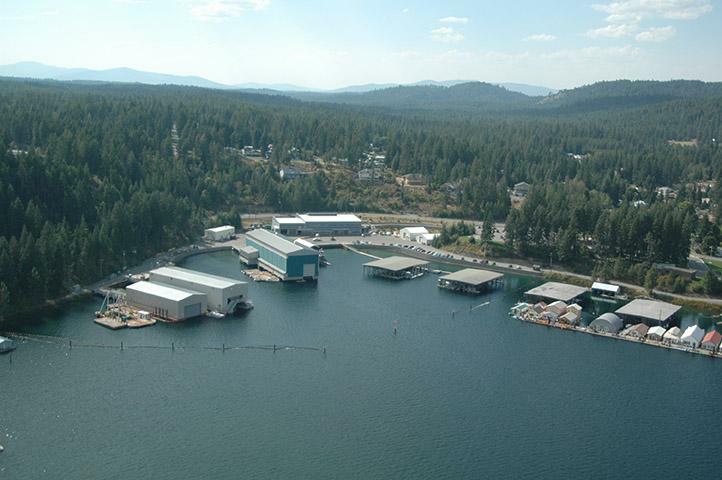 Wed., April 10, 2019, 5 a.m.
An investigation is underway to determine why a barge capsized two months ago at the U.S. Navy’s stealth submarine research facility at Lake Pend Oreille in North Idaho. A Navy spokeswoman confirmed the 48-by-80-foot barge, known as the Experimental Support Platform (ESP), capsized Feb. 11 at the Acoustic Research Detachment base at Bayview. The incident was first reported last week by the Navy Times. Lake Pend Oreille, set in a valley carved by ancient glaciers, measures up to 1,150 feet deep, making it the fifth-deepest lake in the United States. It’s also a serenely quiet body of water, ideal for testing stealth technology without the complications of the open ocean. The Navy has used the site since World War II. The ESP was used to deploy large scale submarine models and for maintenance of an underwater sonic measurement system. Capt. Roxie Thomsen Merritt, a spokeswoman for the Naval Surface Warfare Center’s Carderock Division, said Tuesday that the capsizing remains under investigation, but a buildup of ice may have been a contributing factor. “The weather conditions on Lake Pend Oreille were generally severe leading up to the event, with very cold temperatures and large amounts of accumulated snow and ice on the ESP,” she said in an email. The barge, which the Navy obtained in 1993, has no propulsion system of its own. Thomsen Merritt said it was usually moored toward the southern end of the lake, out of view from the Navy facilities at Bayview. When the barge began to sink, crew members in tugboats and other watercraft were dispatched to haul it back into the bay “to avoid potential damage to the underwater test facility,” she said. A team from the Naval Sea Systems Command was dispatched to stabilize the barge and put together a salvage and restoration plan, which has not been finalized. The Naval Safety Center classified the incident as a “Class A mishap,” meaning the vessel may be totally lost or damage may exceed $2 million. But Thomsen Merritt cautioned that the actual cost may not be so high. “They are still doing all the investigating and assessments and we won’t know the extent of the damage until they are through with the inspection,” she wrote. Published: April 10, 2019, 5 a.m.